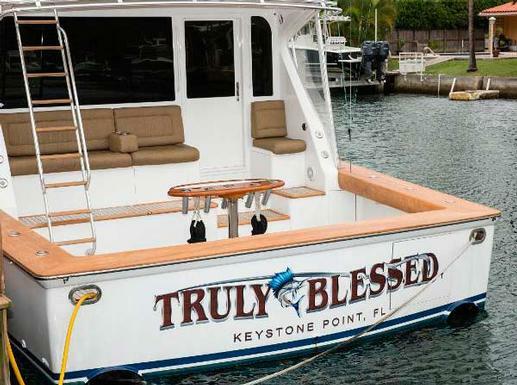 Rarely has a sportfish boat been fussed over by each of its owners as has this 58' Viking. Built at the Viking factory for the original owner equiped optional MTU power and shipped to the Merritt Boat yard for customization and modification of the Hull, interior and exterior areas. The pride of owning this very special boat is the fact that she continues to be fussed over today as evidenced by her recent complete paint job. Nearly $400.000 has been lavished on Truly Blessed in the last three years assuring that her heritage remains as a well thought out one of a kind 58' Viking. Woods & Associates Yacht Brokerage & Realty is proud to announce closing on this legendary Viking Yacht by our broker Matt Woods. Interested in a Viking of your own? See the lineup of Viking Yachts for sale.